WILLIE NELSON: Outlaw, legend, Countryman, Rastafarian? It’s been a long and tempestuous road for music’s braided troubadour, and with a big-time movie, an old-time tour, and a good-time reggae record all on the go, he’s still the wildest ace in the deck. Stephen Mooallem: So, this reggae record you’ve done, Countryman [Lost Highway], has been nearly a decade in the making. Willie Nelson: Yeah. It started around 10 years ago when don Was and I went to Jamaica to see Chris Blackwell, who was the head of Island Records at the time. He had wanted us to do a reggae album, and we did one track, so we took it down to play it for him. He liked it, but I also took a copy of a CD I’d just produced called Spirit, and he liked that, too, so he said, “Let’s put that out now, then we’ll put the reggae record out later.” Meantime, the company had some shake-ups, so Chris moved into another spot, and the reggae album just lay around for a long time. SM: Is reggae music something you’ve been into for a long time? WN: No. When I first heard it, there was way too much rhythm for me. It took me a while to realize that they were doing something with all that rhythm and not just banging. So once I was able to figure out what was going on, I discovered how well country songs could adapt themselves to reggae rhythms. SM: Why did you think they would adapt well? Were there similarities in any way? WN: I tried doing my song “Undo the Right” in reggae style, and it turned out so well that I felt I could do any country song an put reggae rhythms behind it. Then these musicians told me that reggae started from people in Jamaica listening to music from United States radio. The people there had fiddles and guitars but no drums, so they added their own rhythms to what they were hearing. They swore that’s where reggae came from. GM: How did you pick the songs for Countryman? WN: A friend of mine told me I couldn’t do a reggae album without “The Harder They Come” and “Sitting in Limbo,” so I did those. Then I did a Johnny Cash song called “I’m a Worried Man.” When he found out I was doing a reggae album, he played me his song, and I said, “Yeah, that’d be good.” Then on the rest of them, I used a lot of my old songs — just country songs that I’d written back in the ’60s and ’70s. SM: Was it hard waiting for this record to come out? GM: You’re also in the new Dukes of Hazzard movie. How was that experience? WN: Exceptionally good. Movies come along so rarely that when they do it’s kind of like a vacation. You pull the bus in there, and you stay for a week or two, and you get to see a lot of great people every day. GM: You play Uncle Jesse in the movie. WN: Most of my scenes are with Wonder Woman. GM: Oh, Lynda Carter. Who does she play? WN: She plays my girlfriend. WN: Yeah. She’s a great gal. SM: Do you still like being on the road? WN: Yes, I do. I enjoy being able to hang out during the day and not having anything to do until the nighttime. But I do run and try to stay in shape. With the way I abuse myself in the nighttime, I have to do something the next morning to at least even it out. SM: Do you still keep late nights. WN: No, I don’t really. A lot of the old things I used to do, I don’t do anymore. I don’t drink much anymore, so I have no reason to wake up feeling bad. SM: Did you ever think when you were starting out that you would still be touring and playing music at this point in your life? What keeps you interested? WN: Every day is a challenge, for one thing. And it keeps me off the streets. It keeps me from getting into trouble, because I don’t know how to do days off that well. For me, being out on the road, when you’ve got something to do every day, is good therapy. And my boys are playing with me, and they are just incredible musicians, so it’s fun to have them around. SM: Do yout hinkyour sons are going to become musicians as well? WN: No doubt. It just depends on how quick their mom will let them hit the road. She’s very interested in keeping them in school long enough to learn how to take care of the business part of it. I am, too, because i learned mainly by making mistakes. I started out playing in bands when I was around 8 or 9 years old, living in Abbott, Texas. I was living with my grandmother, who raised me. I’d play around town, in school and church and everything, and she said, “That’s all f ine, but I don’t ever want you to go on the road.” So there was a little old club down in West, Texas, about six miles south of Abbott. I went down there one night and played with a bohemian polka band. Nobody heard me, but I made $8. When I got home, my grandmother was a little upset. She said, “You promised me you wouldn’t go on the road.” Six miles away was “on the road” to her. SM: What’s the biggest thing you’ve ever learned? WN: Be careful what you say, and be careful what you promise, and be sure you’re able to do what you say you’ll do. SM: Do you have a philosophy then about, how to go about things? WN: Yes: Fortunately, we’re not in control. 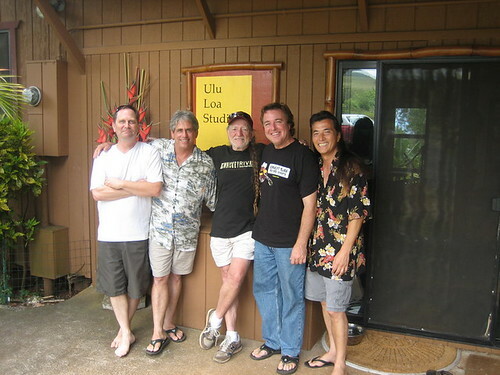 Tom Conway will perform with Lukas Nelson this Saturday night at Charley’s, in Pa’ai, Maui. If you’re new to Willie Nelson Peace Research Institute, first let us welcome you to Willie Nelson’s personal website dedicated to the multiple causes Willie supports. And this A Peaceful Solution video today by Jan Verner-Carlsson (JVC) in collaboration with Calz represents another creative and powerful contribution by folks just like you from around the world. Now in it’s fourth year the A Peaceful Solution project which began April, 2007 by Willie Nelson and his daughter, Amy Nelson contains a library of 300 or so original multimedia productions dedicated to spreading Willie and Amy Nelson’s dream of A Peaceful Solution. One important element these 300 productions don’t show you initially is the sheer numbers of dedicated individuals who gave their time and resources behind the scenes over many months to finally contribute one finished project. Nor does it show international collaborations, new alliances formed and connections that survive to this day which had their births at Willie Nelson Peace Research Institue. The 300 number also doesn’t show all the personal attention and correspondence everyone receives personally from Jay Greathouse and myself, Liz O’Garvey. As artists Jay and myself intimately understand that the creative process for each artist varies considerably. Through conversations by email we can guide each person individually if necessary. We enthusiastically support everyone through personal emails. We always say “We couldn’t do this without you.” And we honestly mean it. Truer words have not been spoken. Jan Verner-Carlsson (JVC) and Calz are from Sweden and Denmark and their collaboration demonstrates one of the revolutionary aspects of Willie Nelson’s grassroots peace efforts. New friends who came together in peace for peace now collaborate regularly on artistic projects to improve life for themselves and others around the world. If you haven’t clicked on any of the links in the article, please scroll to the bottom of this page and see a button dedicated to Willie Nelson’s A Peaceful Solution project. That button is on every one of our 720 page web site. When you get to the individual web pages, you can click on any song, video or feature article to see and hear Willie Nelson Peace Research Institute’s growing chorus for A Peaceful Solution. Willie Nelson gave 5 versions away that you can hear and borrow for your A Peaceful Solution project. You can also hear and borrow other mp3s from the artists who gave their work freely for distribution and attribution. Your name can be a link on Willie Nelson’s A Peaceful Solution project and we give you you’re own personal web page with your feature article which includes your personal unedited artist statement written by you. The statement is not a requirement for publication. It is an option if you choose to add your voice in print for your peace project. Can you see yourself being featured here? Willie and Amy Nelson wrote the A Peaceful Solution song and gave it to the world as a gift of peace. And folks just like you from around the world have become messengers who personally and collectively create magnificent calls for A Peaceful Solution which travel around the world. These testaments to peace live here at Willie Nelson Peace Research Institute for all to see, hear, share and hopefully be inspired to participate in Willie Nelson’s A Peaceful Solution project. Hear “A Peaceful Solution” by Jan Verner-Carlsson. Willie Nelson’s Original A Peaceful Solution project is now in its fourth year showcasing an international spectrum of original productions either in mp3, video or written word. This is not the time to give up on peace. The very existence of the human race depends on us finding a way to live in peace. Monique Claus, from The Hague, has created another beautiful video using the song written by Willie and daughter Amy. She used the version of the song recorded by Lukas Nelson, and the promise of the real. You can view this, and many more versions of the song and more videos at the Willie Nelson Peach Research Institute website. Also, you can learn how you can record your version; or make your own video. The site is an inspiring portal for information about peace and living consciously, managed by Jay Greathouse and Liz O’Garvey and Jay Greathouse. Monique also helped design the new site. 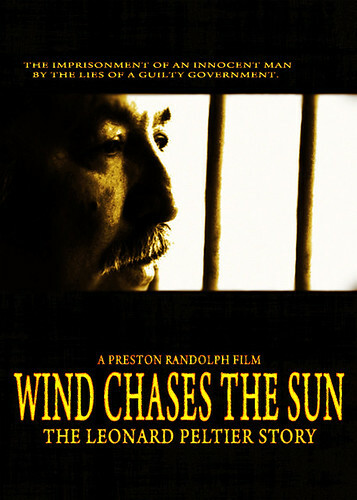 The Willie Nelson Peace Research Institute reports that Preston Randolph is pre-production for the movie, ‘Wind Chases the Sun The Leonard Peltier Story: The imprisonment of an innocent man by the lies of a guilty government.’ Randolp and the Cactus Films production company is calling out for pre-production funds, and need to raise a total of $30,000 to cover costs in order to begin work on the film. Between the years of 1973 and 1975, over sixty Native Americans were murdered during the “Reign of Terror” on the Pine Ridge Indian Reservation in South Dakota. On June 26, 1975 tension erupted with a shootout on the Jumping Bull Ranch between the Federal Bureau of Investigation (FBI) and the American Indian Movement (AIM) members resulting in the deaths of two FBI agents and one American Indian. 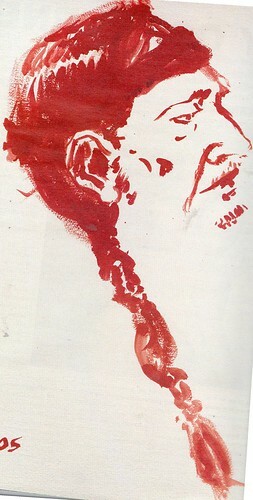 In 1977, Indian Activist, Leonard Peltier was convicted for the murder of the two FBI agents and since has served thirty-four years in Federal prison. 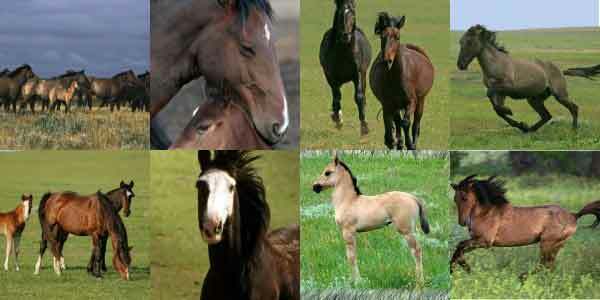 This last one, American Herds, has a lot of well researched historical background. 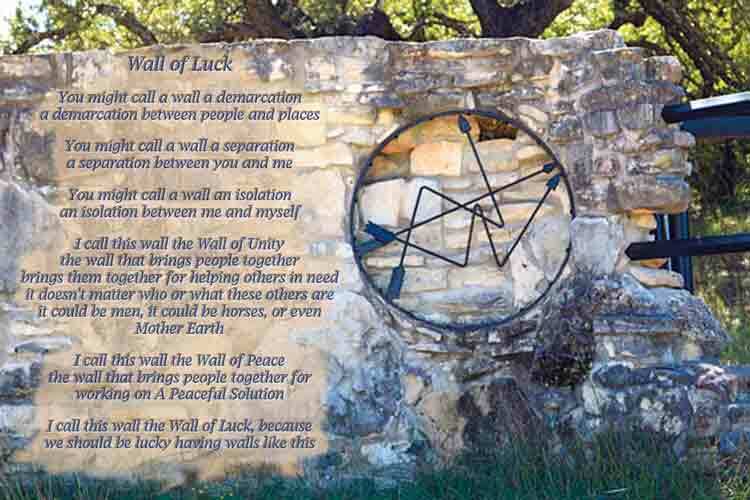 Monique Claus, of The Hague, Netherlands, wrote this poem, and created this beautiful artwork, Wall of Luck. This is the wall and gate of Willie Nelson’s ranch in Texas, with his brand on the gate. 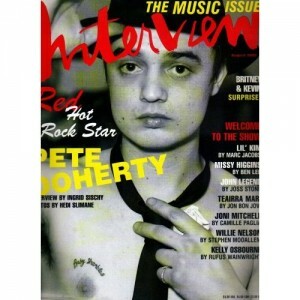 (I think it’ s his brand; it looks like a brand). I thank Monique for sending me a copy of her poem and photo, Wall of Luck. 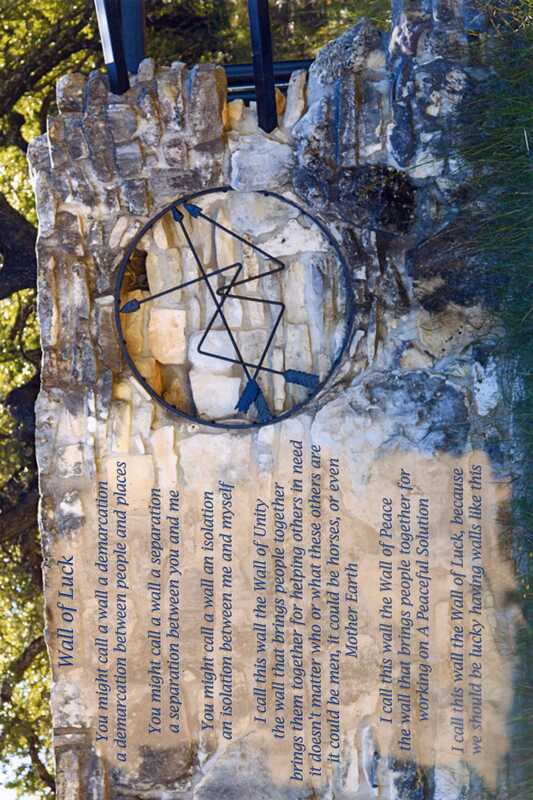 Monique re-designed the Willie Nelson Peace Research Institute, with Liz O’Garveyand Jay Greathouse, and this beautiful artwork was originally posted there. I’m so grateful to have a copy. 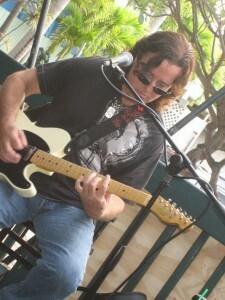 Lucky folks on Maui can see Tom Conway play today at the Tiki Lounge in Kihei. Tom has a new album coming out soon, and I’m excited to hear it. Also, he will be launching a new website, with all the information you need on how we can buy his cds, where he’ll be playing and more. A few years ago, Tom and his previous band, “Gypsy Pacific” recorded with Willie Nelson, who shares Tom’s love for gypsy jazz music. Willie once mentioned on the radio, that he and his son Lukas had taken a guitar lesson from Tom. That album of Willie Nelson and Gypsy Pacific will be great, too — no release date yet, that I’ve heard. Willie is so busy recording, keeping us fans happy. Here is a video by Johathan Kemp, using the song, ‘A Peaceful Solution,’ written by Willie Nelson and daughter Amy Nelson, and sung here by Willie Nelson and Tom Conway and Gypsy Pacific. You can watch many more great videos made using this inspiring songs about peace, at the Willie Nelson Peace Research Institute, at www.WillieNelsonPRI.com. 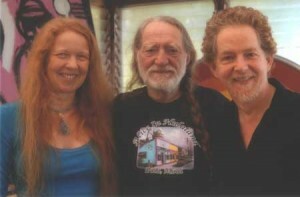 The Willie Nelson Peace Research Institute has launched their new website design at www.WillieNelsonPRI.com. Congratulations to Liz and Jay Greathouse, for all their continued hard work. Their new design brings new focus to all the causes that Willie Nelson works hard for: peace, animal rights, family farms and sustainability, human rights and more. The beautiful new design was created by Monique Claus, from The Hague, the Netherlands, who was inspired by the website, and by Willie Nelson’s music. 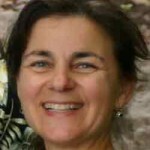 She has been working with Liz O’Garvey and Jay Greathouse to create the new streamlined design. You can still view and watch all the inspiring versions of the song, ‘A Peaceful Solution,’ the song written by Willie Nelson and Amy Nelson, inspired by a dream of peace that daughter Amy had. And there is even a video demonstrating how to play the song, and instructions on how you can record and submit your own version of this inspiring song. And you can continue access all the thought-provoking, informative articles. Great job Liz, Jay and Monique! Visit www.WillieNelsonPRI.com to see the new design and content. 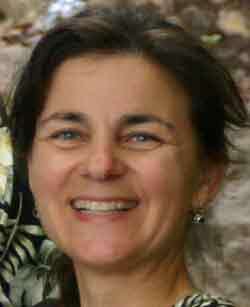 “Craig and I lived in rural upstate New York for several years. It is our home state, and we have many wonderful memories of our local farmers as friends and neighbors and also from county fairs and 4H events. We gained the richness of their lives and work. It was a happy time then. However, unfortunately, those times have changed. A nation that does not have an abundance of small family farmers ~ is an impoverished nation in body, mind, and spirit. And, that is where we’re at right now. Today, for every family farmer who is being torn apart by financial devastation, it tears apart the farmer, his family, and eventually the country. Like a hurricane or tornado, this is each farmer’s devastating private storm. For Willie Nelson and all his Good Works! Willie, what a pleasure it is to be even a small part of being able to help save the family farmers of this land. stv posted his animated version of ‘Peaceful Solution,” written by Willie Nelson and his daughter Amy. You can enjoy many other inspiring renditions of this song (and maybe be inspired to create your own) at www.WillieNelsonPRI.com. at 3:03am on the bus in California, on the way to Coachella. There is a peaceful solution. It’s called a peace revolution. Now let’s take back America. There’s a war and we’re in it, but I know we can win it. So let’s take back America. It’s a dream, so believe it. Now get ready to receive it. And let’s take back America. let’s remember how we done it so we don’t have to do it again. Jerry Miller totally rocks out on this tune. Jan Lewis and Robert Berry developed this arrangement, and Jan Lewis wrote a bridge for the tune. Special thanks to Erik Adelfred who developed the graphics and the video. Jerry Miller playing Buelah on this tune is simply some of the hottest guitar on utube. Song by Willie Nelson and Amy Nelson Performed by the Remington Riders Arrangement by Jan Lewis and Robert Berry Bridge by Jan Lewis Jerry Miller – electric guitar Jan Lewis – vocals and piano Robert Berry – bass, drums, acc guitar, bg vocals Video and graphic design by Erik Adelfred. See more videos and hear more versions of this song at www.WillieNelsonPRI.com. This Button can help secure your food supply and reestablish the economic foundation of the United States. Willie Nelson and Marty Dread offer Lend A Hand To The Farmers for open collaboration to help spread the word of the need to help our primary raw materials producers, The Farmers. Make your own video using Lend A Hand To The Farmers as a soundtrack. Upload your video to YouTube or some other online video hosting service then contact us here or use the form below. Record your own version of Lend A Hand To The Farmers and contact us here or use the form below. We will tell you where to send a mp3 file when you contact us here or use the form at http://willienelsonpri.com/peace/5430/lend-a-hand-to-the-farmers-license.html. If you prepare a statement to the same standards as our Press Release Submission Guidelines then we will publish it. We will tell you where to send it when you contact us here or use the form below. You may already be familiar with the Willie Nelson Peace Research Institute “A Peaceful Solution” project. This project will be handled in much the same way. The Story of Lend A Hand ToThe Farmers was the topic of an earlier post. Now You can become the topic of a related post on this blog. Make a video or record your version of Lend A Hand To The Farmers and become part of the movement to secure your food supply and reestablish the economic foundation of the United States. Willie Nelson Peace Research Institute at www.WillieNelsonPRI.com invites all individuals, network members, community representatives, and Non-Governmental Organization (NGO) spokespersons throughout the world to submit press releases about their methods of promoting a peaceful world through thoughts, words and deeds. Willie Nelson Peace Research Institute encourages diverse points of view on topics in a number of areas as long as they all obviously contribute to a more peaceful world. Highly opinionated judgmental criticism without a suggestion or clue for positive change may not seem appropriate. While specific criticism may be deserved in the context of communicating certain grievances suggestions for positive policy changes will always be welcome and appreciated. Make initial contact through the Willie Nelson Peace Research Institute Contact Form. Willie Nelson Peace Research Institute will reply. Attach your press release as a text document to your reply email. Do not paste press release in the body of your reply email. Press release length: Minimum 300 words, maximum 3,000 words. Do not use CAP LOCK. Capitalize the first letter of words if you wish. CAP LOCK makes it harder to read. Anything submitted all caps will be discarded without reading. Use a single space after sentences. Anything submitted with double spaces will be discarded without further consideration. Use consistent style throughout press release. All abbreviations and acronyms must be defined when you first use them. You may request links with your press release. Check all links before sending. Do Not include dead or under construction links. You may attach a single image 500 pixels wide. These general guidelines represent no guarantee of acceptance of any specific press release for publication by Willie Nelson Peace Research Institute. Although it is not our policy, Willie Nelson Peace Research Institute reserves the right to ignore any submission with no explanations.